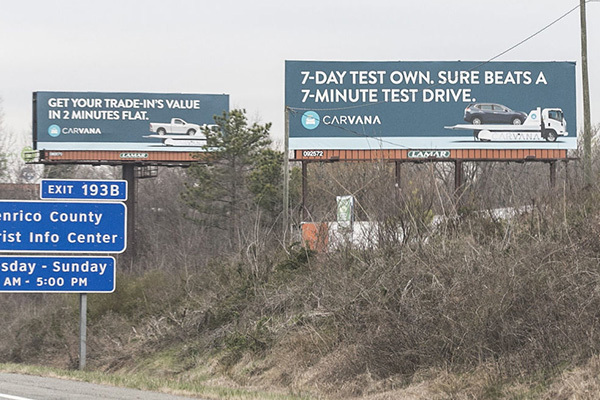 Just in case you miss the first six Carvana billboards along Interstate 95 southbound in Richmond, you can always catch the next seven or eight on an approximately 10-mile stretch between downtown and Chesterfield County. The Arizona-based online used auto retailer has placed dozens of billboards along I-95, Interstate 64 and Interstate 195 in the Richmond area advertising its e-commerce car buying service. The 5-year-old company expanded to the Richmond market in June 2016 and delivers cars in 55 markets across the U.S.
“It’s hard not to see them,” said Bill Bergman, a lecturer in marketing at the Robins School of Business at the University of Richmond. “It’s a media strategy that basically says I am going to blitz one medium and get your attention,” said Bergman, founder of The Bergman Group, a Henrico County-based advertising and marketing firm. In Carvana’s business model, customers can view, buy and arrange financing for vehicles online. After the deal is done, Carvana delivers the car to the customer’s door or designated location. Customers have a seven-day “test own” period. “They are really trying to make a statement that they are a player in the Richmond community,” said Kelly O’Keefe, VCU Brandcenter professor of creative brand strategy, who also has noticed the billboards. “They have shown a real interest in Richmond. It’s an important market. ... I can’t read their thoughts as to whether or not they want to thumb their nose to CarMax a little bit. It could be a combination of factors,” O’Keefe said. Goochland County-based CarMax Inc., founded in 1993, is the nation’s largest used vehicle retailer. CarMax vehicle sales for the 12 months that ended Feb. 28 were 671,294 vehicles sold at retail and 391,686 sold wholesale at its in-store auctions. CarMax has 185 stores in 41 states and plans to open 13 to 16 locations this year. Carvana in 2017 sold 44,252 vehicles at retail, according to company financial reports released earlier this month. Carvana CEO Ernie Garcia said on a March 6 earnings conference call that the company missed its sales targets for the fourth quarter even as its revenue grew 148 percent in the fourth quarter year-over-year. CarMax’s first store on West Broad Street at I-64 is not far from where Carvana last year filed then dropped plans to build a token-operated, 71-foot-tall, eight-level automobile dispensing machine on Tom Leonard Drive in Short Pump. Transportation economist George Hoffer said Carvana’s strategy seems to be the same strategy that electronics retailer Best Buy took when it came into the Richmond market challenging rival Circuit City, which created CarMax and then spun it off. “I think it’s the same here — an in-your-face attitude by Carvana toward CarMax. That is why they wanted the Short Pump space for their (auto dispensing) tower — in your face,” said Hoffer, an adjunct professor at the University of Richmond. 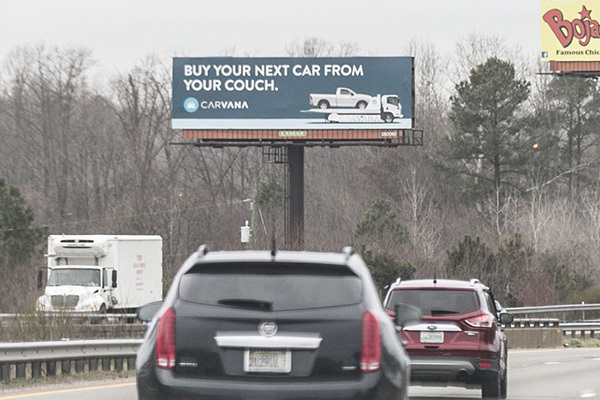 Carvana’s billboards advertise the company’s streamlined buying process with copy that reads: “Personalized Financing Pronto,” “#UnsuckingCarBuying,” “Buy your next car from your couch” and “Enjoy car buying without the bitter aftertaste,” among others. Lamar Advertising declined to disclose what Carvana is paying for its billboard space. VCU’s O’Keefe said billboard advertising costs can range from hundreds of dollars a month in outlying areas to thousands of dollars a month in highly trafficked, highly visible locations. Carvana, in its earnings call, said marketing/advertising costs per unit sold has steadily dropped. Carvana plans to open in 30 to 40 additional markets this year. CarMax has been testing a similar model for customers to buy and finance vehicles online with at-home delivery in Charlotte, N.C., and has expanded its online financing portal. Bergman said Carvana is trying to disrupt the experience of going to the dealership. CarMax, in the same way, was also an industry disrupter when it was created with large used auto stores instead of a bunch of small lots, Bergman said. Lamar Advertising is now delivering outdoor advertising campaigns utilizing its new bus shelter inventory in Cleveland, Ohio. 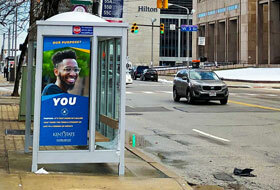 The first campaign, designed to promote Kent State University, one of the largest universities in Ohio, utilizes 15 of Lamar’s new bus shelters. 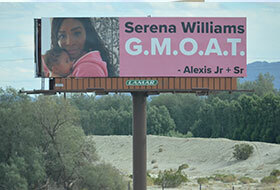 Tennis star Serena Williams' husband used Lamar billboards to welcome her back to tennis following birth of daughter in September.